Let’s get this out of the way first: if you’re looking for a tool for composing and editing scores on your iPad, Avid Scorch isn’t it — not yet, at least. But as a score reader, Scorch could be a glimpse of a future in which tablets create a new marketplace and exchange for notated music. 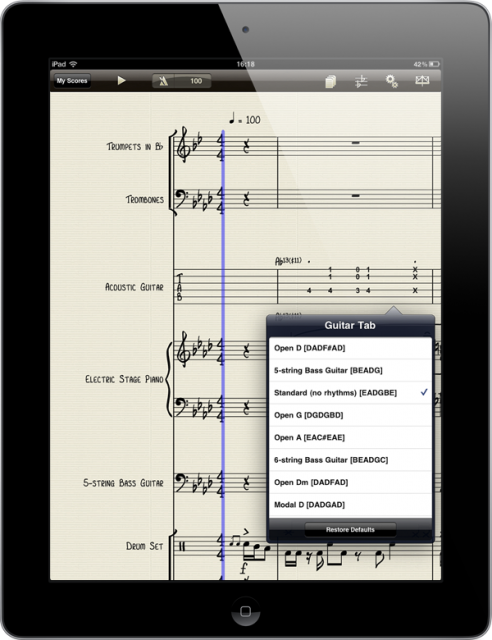 The role of tablets in digital music is still evolving. But it’s not hard to make a case for the form factor here: unlike a MacBook Pro or a PC tower, you can put a tablet on a music stand. As such, a tiny device can have dynamic access to a near-limitless collection of music. We’ve already seen impressive takes on the classic jazz fake book on the iPad, and they handily beat the older form when it comes to weight or bulk. In some early glimpses of the utility of digital scores over printed ones, Scorch can transpose quickly (top), or even convert a line to guitar tab (bottom). 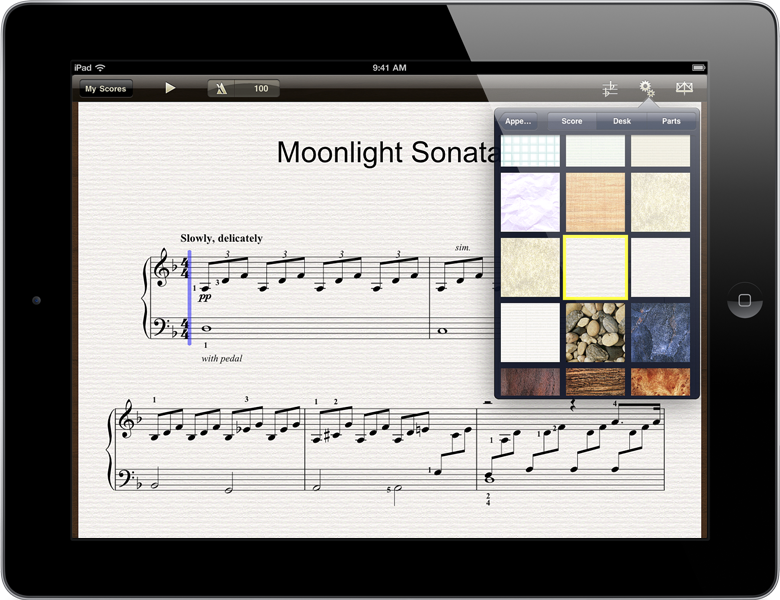 You can also zoom, change fonts and appearance, and set up the tool for page turns. What you can’t do, yet – edit. Some early tablet tools for iOS and Android suggest what could happen there; expect more to come. Other features could broaden the appeal of notation in general. With one tap, you can convert a line to guitar tab, dynamically, as seen in the image below. You can change fonts, or pull out a single part, in order to improve readability. These are things that would normally require a copyist to go back to the drawing board and make new parts, even in the computer age. The very notion of what a score is is changing: that score becomes dynamic, electronic, and live, open to instantaneous shared revisions. Scorch could be the start of something big – and with electronics makers around the world, not just Apple, betting on the tablet, it could be a sign of other tools to come. I still imagine many people want to use tablets to make scores, not just consume them, and I expect that to be a growth area, too. But Scorch is notable as the first big-league entry into what could be a transformative arena. And it could be transformative in ways that are more profound than even digital distribution of music. Notation has evolved the way it has on a paper medium, designed to be fixed, still influenced by the conventions of the pen and engraving. 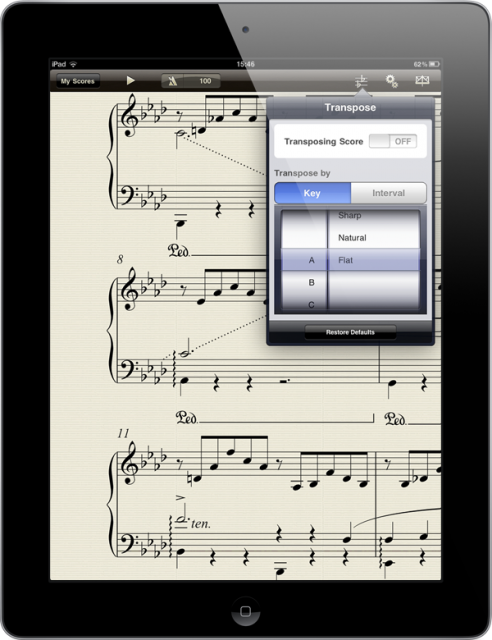 The next question: will scores, from creation to display, need to change, too?